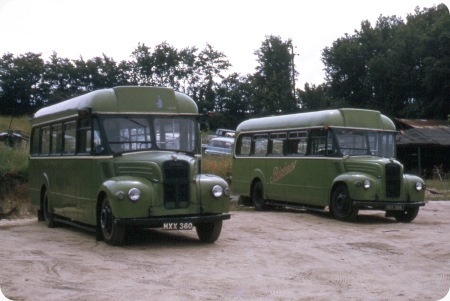 In 1969 Bickers bought two Guy GS buses, MXX 356 and 360 which were GS56 and GS60 in the London Transport fleet. Here is a picture of them in 1975. The following year they were both sold into preservation, though I believe that neither has been seen about in the last few years. Unless you know different that is, you know how to get in touch. Give me a big engined AEC or Leyland any day but these big hearted babies are full of character and deserve their place among the preservation greats. These two look a little mat paint/MOD and well used. Even more testimony to their initially build quality – but they look even better in LT/Country green, gleaming on a running day. The modern day equivalent is a Mercedes Vario or IVECO Daily. In the words of one of my choir, who spent his professional life working for Tilling subsidiaries, "I know which ones will last longer." I drove the Tillingbourne examples of the GS in the Guildford area, and I found them to be delightfully robust, positive little machines, though the clanky sounding Perkins P6 engine didn’t impress me very much. The GS was another of those buses with a "right to left" wrong way round gearbox, and I have always wondered who made it. Was it a Guy box, or something from another maker? Also, was it yet another manifestation of London Transport’s flat earth outlook that led it to commission Guy to manufacture a specially designed 26 seat model? 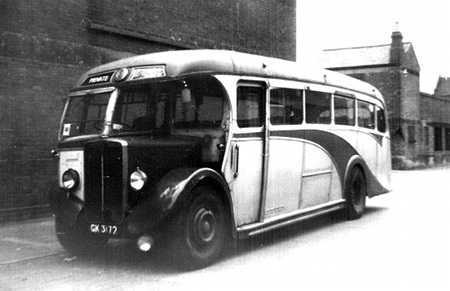 Dennis had been producing successful buses of this type for years, and the LGOC had purchased a fleet of around forty Darts in the 1930s. The logical move for LT in the 1950s would surely have been to obtain a P6 powered version of the established Falcon. The GS was (indeed still is – there are lots still around) a really good little bus, but I remain perplexed that it was ever ordered in the first place. GS’s were certainly a hybrid ‘special. Based on a modified Guy Vixen chassis, it sported a Perkins P6 indirect-injection, 65 bhp engine, with 4-speed crash gearbox. It was a rare example of London Transport buying an ECW body, which it was supposed to buy in preference to other makes. However, off-hand, I can only think of RFW’s as the other example in post-war years. Even so, LTE put their stamp on it, as it bore a remarkable resemblance to the RF body at the rear. At least they had long and useful lives and as David says, they are rather attractive and purposeful souls. As Roger says LT always had some rather odd ideas – the prewar rear engined Leyland CRs spring to mind with only twenty seats AND a conductor !! I too have always admired the little GS class, surely one of the most handsome small buses ever. The CR’s were designed for OMO, but, post-war, with the huge increase in passengers, those OMO routes in Central Area were either abandoned/absorbed into other, busier routes or served by full-sized buses, rendering these ‘babies’ surplus. However, they were spread about and used, as a last resort, to replace full-sized vehicles which had failed, hence the two-man crews. Ill-suited to intensive work, and under-developed, they often crumpled under the strain. I made one journey, on just one, in such a situation. It coped! Thanks for that Chris H – that’s something I never knew despite owning much bookware about LT – you’re never too old to learn as they say. A nice coincidence is that Leyland’s light 6-cyl diesel used in the CR had the same bore and stroke (3.5" x 5.0") as the Perkins P6 used by Guy in the GS. Both engines were indirect injection and shared that light tinkling "threepenny bits" combustion note. The only ride I’ve ever had in a CR was at Cobham (held at Chobham) a few years ago, and the engine sound was remarkably Perkins-like. Another thing I learnt that day: the big-diameter rear hub houses not a double-reduction gear but a universal joint, so the CR evidently didn’t have a beam axle. 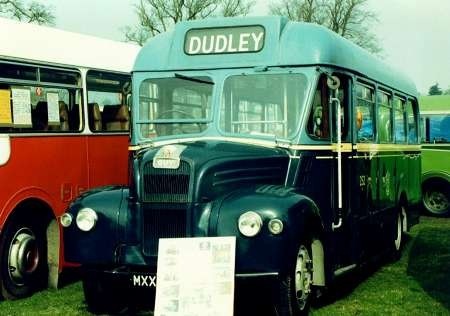 Douglas Corporation ran some Guy Gs style buses with Mulliner bodywork. They were fitted with large upright destination screens front and rear. This gave rise to their nickname of Wolsey’s camels after the then manager. Douglas also bought what I think are the only Leyland Comets in municipal service. Chris Hebbron – re LT buying ECW bodies, there was also SLT 59, (CRL4/RMC4), the first Green Line Routemaster. Thx, Bob, for the titbit on SLT 59. ECW must have struggled to meet that order on time! I always thought it looked smart with its framed side lower-deck windows, but had a feeling that the full-width lower rear window looked as if it wasn’t centred properly, or was that my imagination? There are pictures of SLT 59 on the web including www.londonbuspage.com/ which has this and KGJ 603D which is obligingly pictured from the rear with what also appears to be an off-centre rear window: is this to stiffen the corner by the rear door? Does anyone know anything about the ECW (presumably) system on the VR which sucked all the cig ends and packets out of the upper deck through a port at the back? Now that’s innovation…. In the 1980s I owned GS 36 it was a joy to drive once you got used to the gearbox, double de clutch comes to mind, sorry I sold it. On 2/5/10 I took the above picture although I cannot remember where I took it. As I had retired to Cornwall in 2008 and was visiting all the shows I can only assume that it was in Cornwall. I used your site to try and identify the model and any other details available and when I selected the Guy GS model found a photo of 2 buses under the heading of Bickers of Coddenham and comments that the picture was from 1975 and with registration numbers MXX 356 and MXX 360. 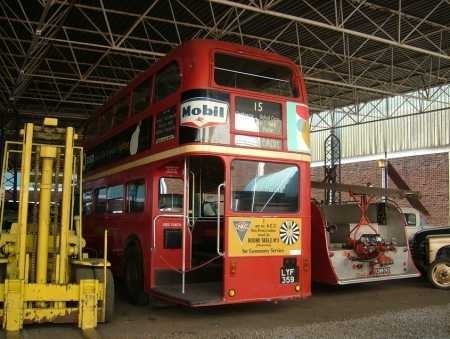 It further stated that the buses had been sold into preservation but not seen in the last few years. As the photo I took has MXX on its plate unfortunately the numbers are hidden. I just thought that it may possibly be one the buses in a new livery so I forwarded it for any information possible. This bus is in the distinctive livery of West Bromwich Corporation, and you can just make out the fleet number 252. The registration would be MXX 340. It was acquired from London Transport in 1961. This is all new to me. I am enjoying the various photos and comments. On the Home page there are photos of the Guy Specials. Although the original contributions were some 3 years ago, the attached may be of interest showing the only GS painted into Tillingbourne blue seen at Rusper on the service to Horsham on 1. 7. 1972. The driver may well be your contributor Roger Cox. Thanks to the driver for the ride. Welcome, Keith and thx for your photo. It certainly looks very odd out of LT colours! No, it’s not me, Keith. 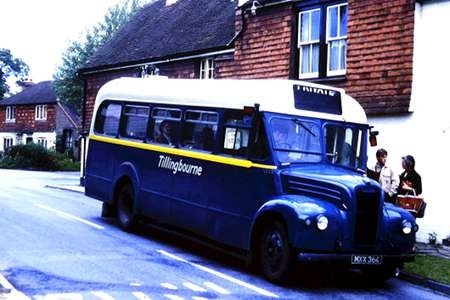 MXX 364, ex GS64, was the only GS painted in the then new blue Tillingbourne livery shown in your picture. It was out stationed for a time at Horsham (on a rotational basis with one of the SUs) for the Horsham-Rusper circular route. Although I did drive the SU4LAs on this service, I didn’t take GS64 in its new livery. This was the last GS bought by Tillingbourne (in April 1971) and the last to be operated, being withdrawn in October 1972. Here is another Tillingbourne GS, MXX 382, ex GS82, seen in Horsham Carfax when ‘On Hire’ to North Downs Rural Transport in 1971. 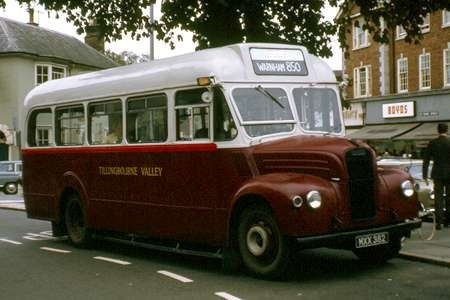 It is in the revised livery initially adopted by Trevor Brown in September 1970 when he took over Tillingbourne Valley from the Trice family who had run the business since 1924. Later, the blue livery shown above in Keith’s picture replaced the maroon, though MXX 382 was never so repainted, being withdrawn in March 1972. North Downs itself, after struggling with low revenues and maintenance issues, finally expired on 17 April 1972, whereupon the Horsham services became part of the Tillingbourne network. David Call is right. Stage was the highest category and the most demanding. Express was in the middle and the lowest category was contract. I worked in the Metropolitan Traffic Area’s PSV licensing team in 1963 and 1964, and I handled very few contract PSV licences. One oddity about the Metropolitan Traffic Area was that it did not handle licensing of drivers or conductors, which was handled by the Public Carriage Office of the Metropolitan Police. Another was that London Transport not only trained their own drivers, but tested them as well! My original PSV was passed in London in 1967. In 1972 I moved back to Manchester and when my licence came up for renewal I had to surrender my ‘N’ badge for a ‘CC’ one. The new one was a bit slow coming so I went along to the office in Manchester to enquire why. Not so, Designated Examiners were common practice in the larger Companies, and Municipal Undertakings, and still are. There was a specified number of Drivers who had to be employed, I think 300, to qualify for one, and the Examiner was not to be the same person as the one who undertook the Training. This was to alleviate the pressure off the Ministry of Transport. In the past there were no separate Department of Transport Driving Examiners, PSV Tests were carried out by the Area Certifying Officer (The Ministry Man). He would re-certify a few vehicles in the morning, and then carry out a few PSV Driving Tests in the afternoon, or visa versa. At Oldham Corporation I seem to recall it was a Tuesday. Also you did not get a pass or fail off him, and no pass certificate. He just said he would make his recommendation to The Traffic Commissioner and you would hear in due course. You did not know if you had passed until your Licence and Badge arrived. Here is a pair of poor photos taken in Great Yarmouth in August 1958. As a London Transport spotter predominantly, I was excited to note the registration GK 3172 on a cream and green AEC coach under the Bickers title – it had to be an ex-London bus! 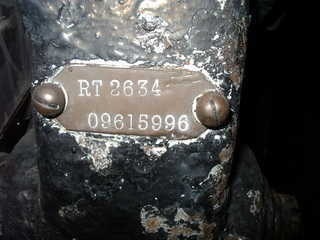 I guessed it could be an ST, STL or T. Inspecting the dumb-irons was the easy way for those in the know, and there was indeed the brass plate on the right hand iron but the left hand one which would have given me the fleet number had been removed. Later I found that it was formerly T 300 which had been delivered in 1931 and withdrawn in 1938, bought by Arlington Motors, Vauxhall Bridge Road, The driver told me his boss had picked the vehicle up from a scrapyard, with that non-London Transport body already fitted – he thought, perhaps, off a Leyland. A letter to London Transport gave me the stock number and some of these details. How kind companies used to be to little perishers who pestered them with daft enquiries! Sometimes I gathered redundant discs from such ‘finds’ and nowadays some folk collect them – so below are those from T300, in case any of you chaps are interested. Gut instinct. Shape of destination indicators and circular insert. Looks a bit Plaxton to me. Would have been an early one – even off a Leyland. Would also have been rare to see a Plaxton in or from the London area. How useful those little brass plates on the dumb-irons could be – I found them indispensable when finding old LT buses as showmen’s vehicles at funfairs! Looking at the indicator area above the cab, the body looks as if it could well be a Duple. Bearing in mind cheap labour in those far-off days, organisations as big as London Transport might well have employed a special "Clerical Officer, D.E.L.P." (Daft Enquiries from Little Perishers) to answer such esoteric questions! Most fascinating to notice from the two PSV licences that this fine vehicle had been demoted in April 1955 from "Express" to "Stage" – so often the fate of luxury coaches whose charms had begun to wane, but to the advantage of the service bus passengers who benefitted !! As an addendum, the excellent website, Ian’s Bus Stop, shows that the vehicle was sold to Arlington Motors in August 1938, then bought by Osborne of Tollesbury, who had it re-bodied it by Duple as C32F. 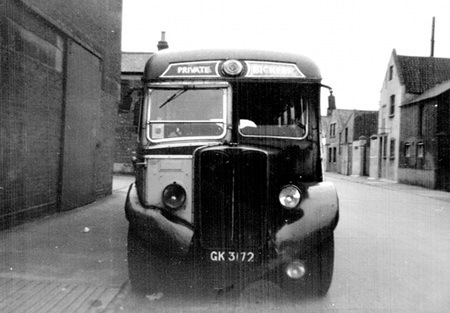 It was in service with Bickers in 1954 and withdrawn in March 1959. T300’s body was transferred to T369, which suggests that only the chassis was sold by LPTB. Well, it was a pleasant surprise to find this operator appearing on the web site as I am sending this note from a computer less than four miles from the Suffolk village of Coddenham. Indeed a work colleague was brought up in Coddenham and knows various members of the Bickers family. She has recalled that in her childhood Bickers vehicles always seemed to be older (i.e. more interesting to us) than those of other operators. Alfred C. Bickers (father of the Geoffrey Charles Bickers shown on the licence) had begun running into Ipswich from Coddenham by 1925. In April 1927 he bought a new 14 seat Ford Model T bus RT 2975 which no doubt became obsolete by the 1930s and was discarded. Many and various buses, (nearly always second hand) were bought until 1988 when that part of the business was divided between Eastern Counties and Ipswich Buses. Imagine everybodys surprise when about ten years ago there appeared on the Ipswich – Felixstowe Vintage Vehicle Run a Ford Model T RT 2975 bus complete with original log book, entered and restored by David A. Bickers of Coddenham, grandson of the original owner. In the 1960s Dave Bickers was a well known motor cycle scramble rider and later he and his son Paul started to do stunt engineering work for films including a number of James Bond movies, see www.bickers.co.uk Clearly the restoration of a bus would have posed little problem to such a family of engineers. The PSV Circle states that GK 3172 was scrapped after withdrawal by Bickers but then that was what they said about RT 2975! Chris Hebbron alludes to the brass dumb-iron plates to be found on all the period London buses. Above is the plate of the RT which languishes in the Johannesburg Museum of Transport, which I was amused to photograph on 2005. Chris Youhill comments (above) about the apparent demotion of this vehicle from Express duties to Stage. 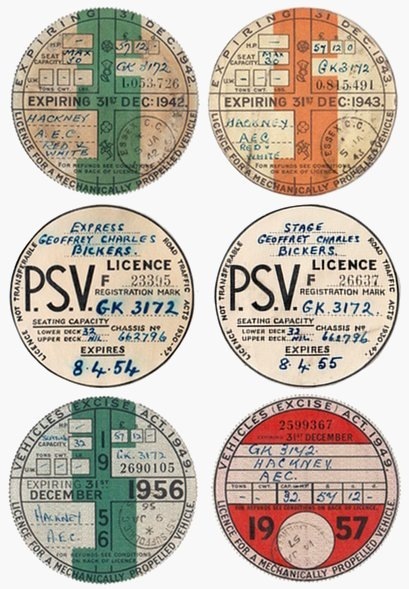 My own memory is becoming a little hazy now, but my recollection is that, when it came to vehicles’ PSV licences, ‘Stage’ was a higher category than ‘Express’, i.e. with a vehicle licensed as a ‘Stage Carriage’ you could do everything you could have done with one licensed as an ‘Express Carriage’ – and more. The requirements for a ‘Stage’ licence were stricter – e.g. a passenger/driver communication system (i.e. bell or buzzer) had to be provided. Most vehicles were licensed as ‘Stage’, irrespective of the sort of work they were likely to be called upon to do. I missed David Call’s comment of a couple of years ago. The classifications ‘Stage’ and ‘Express’ Carriage referred to Road Service Licences, the licences granted to operators by the Traffic Commissioners to run passenger services between specified points to a published timetable via a detailed route stopping at particular points at stated fares. The maximum size of machine for each route was also dictated. The vehicles were all licensed as psvs, and had to pass Certificate of Fitness tests at fixed intervals according to age. Thus coaches could be used legally on bus services and buses on coach services (the latter sometimes to the discomfort of passenger posteriors, no doubt). All this has changed, of course. Buses and coaches, like all vehicles of three years of age or more, now have to pass an annual MoT test, and the number of vehicles that a commercial operator can run is limited by the Operator’s Licence. The actual passenger services/routes are no longer licensed at all outside London. Bus companies today can run what they like when they like, and charge what they like for the (often dubious) privilege, subject to 42 days notice being given to the local Traffic Commissioner for applications for new or changed services. This is a late comment but the difference between stage and express was merely that of the minimum fare charged.Express services had a minimum fare of one shilling and "excursions and tours" was merely a special variety of express carriage. I think that vehicles used purely for private hire were licensed as "contract Carriage" but I am not sure about that – it is a long time since I did my Institute of Transport course and by the time I got my CPC (Operators licence) it was all irrelevant anyway.